"We are extremely excited to be working with someone as creative, talented and visionary as Madonna," said Sakchin Besette, Partner and Creative Director, Moment Factory. "Our team is comprised of artists whose expertise ranges from software development to motion design and all of us are absolutely delighted to be working with an artist whose creativity continues to astound us. Moment Factory always looks to engage audiences with something they have never seen before, and we are certain that this show will thrill spectators." Based on the Moment Factory's track record the Super Bowl 2012 Halftime Show should be spectacular. Below you can watch what the company did for the Arcade Fire show at Coachella 2011. Arcade Fire - Coachella from Moment Factory on Vimeo. 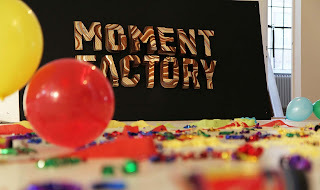 See more videos on the Moment Factory site.